One of the most common shortfalls of feather and down pillows is that they tend to lack sufficient plumpness for side and back sleepers. As a result, feather and down pillows have gained a reputation as sometimes being "pancake-like" and therefore, are passed up altogether by some shoppers. Pacific Coast Feather Company ® aims to dispel the myth that all natural fill pillows lack loft with their Double Down Surround� collection. 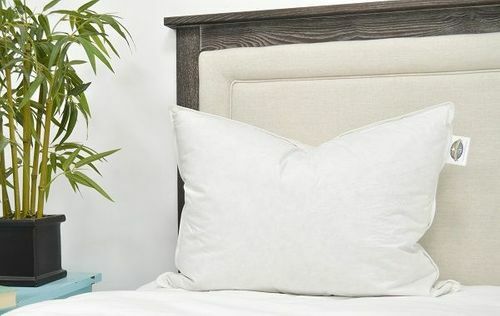 The Pacific Coast� Double Down Surround� Pillow boasts unique construction and premium materials, resulting in a first-class pillow renowned the world over. The Pacific Coast� Double Down Surround� Pillow makes the enjoyment of a luxurious feather and down pillow possible for everyone, regardless of sleep style! Discover the difference that a well-made pillow can make in your life, order your own Pacific Coast� Double Down Surround� Pillows today! Size: Standard 20"� x 26"